Some of you may have noticed. Recently we launched MailFred – a small helper for GMail – in public beta. MailFred is supposed to increase my – and potentially your – personal productivity. There is one simply reason we built MailFred: We love the concept of Inbox Zero. And MailFred does help achieve just that. So we are really scratching our own itch. Inbox Zero is a term coined by Merlin Mann, founder of 43folders. The basic idea is to have your inbox to “zero” most of the time (at the end of the day or at least at the end of the week). That’s not “Zero mails unread”, that’s “Zero mails I need to do something about (right now)”. Every mail is an “action” item. 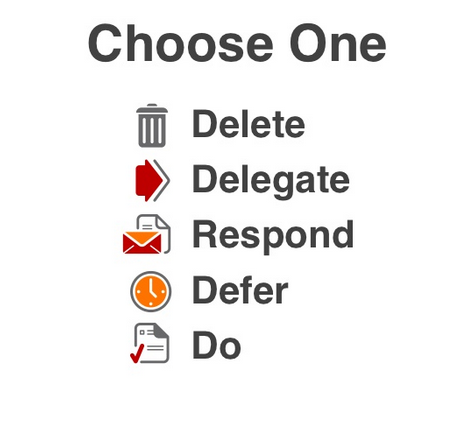 Once a mail is opened/read there are five “purposeful” actions: delete, delegate, respond, defer, do. Choose at least one. Image source: Slideshare presentation by Merlin Mann (see below). 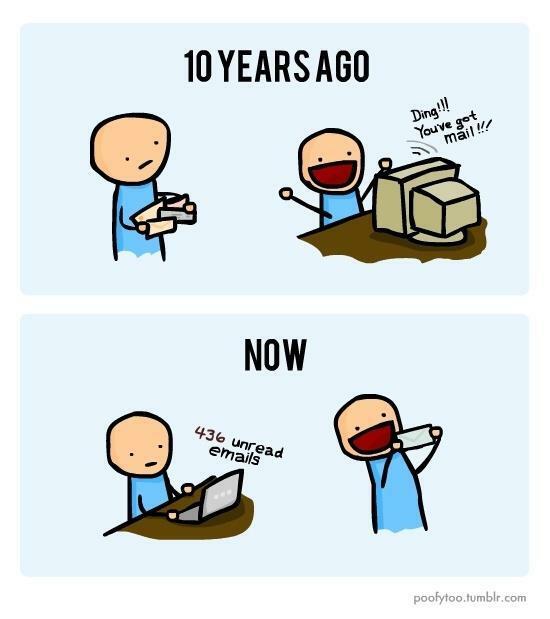 The amount of how often a mail is touched is drastically reduced. Clutter is removed from the inbox. Mails are out of your head because they are where they belong. It just feels better, doesn’t it? If you have more time you can also watch this video with a presentation at Google from 2007. What do you think? Do you use inbox zero? Why, why not? Merlin Mann, a well known productivity guru and creator of the popular 43folders website talks about Getting Things Done, the importance of getting your inbox to zero, and strategies for dealing with high volume email. If you find yourself day after day with too many unanswered emails in your inbox, this is a presentation for you. I can recommend the Q&A part too. 1. Add reply buttons for YES, NO and MAYBE. Some messages just don’t need a comprehensive reply. 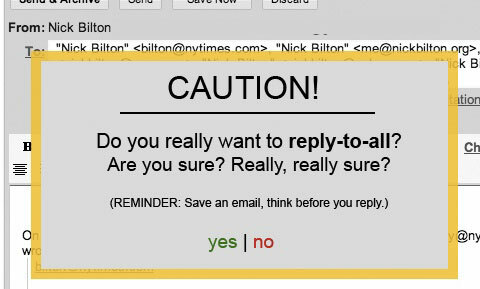 If someone e-mails me and asks if I’m available to attend a meeting, rather than take the time to write back with a detailed response, why can’t I just click a YES, NO, or MAYBE button? One click and the e-mail has been dealt with. 2. Use browsing history in a smart way. When people send me news items or blog posts, my e-mail program could check my Web browser history to see if I’ve already been to this specific URL. If so, the message should skip my in-box. 3. Add the ability to take yourself out of the reply chain. 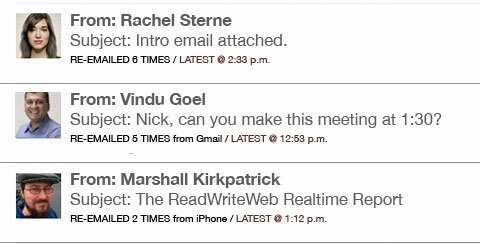 I regularly send messages to introduce friends or co-workers to each other. These introductions are usually the standard “Hi Jane, I’d like to introduce you to Bob.” After a connection is established, I’m often forced to sit on the sidelines getting a barrage of messages as Jane and Bob converse. It would be great if I could preemptively remove my address from these replies. O.K., I know this one is a stretch, but what about crowdsourcing my in-box — opening it up to the general public? Then, when I get that forwarded e-mail from a co-worker announcing that the government will start taxing people for every e-mail they send, someone else could respond explaining that, sadly, this is actually fake. This scheme would require correspondents to label personal or private notes that would then stay out of the crowdsourcing zone. 5. Eliminate the “reply-to-all” feature. Ah, the reply-to-all e-mail faux pas: You’re invited to an event via a large group e-mail and one person responds to everyone with a pointless “Great, I’ll be there!” If a cold-blooded extermination of this feature is too radical, maybe we could require a stern CAUTION alert whenever someone attempts a reply-to-all. 6. If the e-mail is important, it will find me. Real-time services like Twitter and FriendFeed illustrate the potential usefulness of a streaming interface. I don’t have to see all the tweets in my stream; if something is specifically important it will be re-tweeted by people in my network. The more this happens, the better the chance that I will eventually see it. What if we made e-mail into a stream? If a message is important, people can re-mail it, and it then moves back to the top of the list. 7. Cut off anything longer than 140 characters. Speaking of Twitter, do we really need more than 140 characters for most messages? E-mail applications could add a button that would cut off all content longer than 140 characters. E-mail applications are essentially dumb clients. They don’t know much about you, or your e-mail, and if they do, they don’t use this data to help manage the content. There are people working on this problem and coming up with solutions like Kwaga, a semantic-language enhancement for your e-mail. But there could be other additions to these smart clients. For example, let’s say my e-mail application understands that I have an @nytimes.com address. During the day other @nytimes messages could receive higher levels of attention than mail from my wife or brother-in-law. In the evening, this rule could flip, placing work messages on the back burner. 9. Create an “Auto Filter” button. Clay Shirky, author of the book “Here Comes Everybody: The Power of Organizing Without Organizations,” believes that “we don’t have information overload; we have filter failure.” I completely agree with this, but creating filters can become a chore too. My solution would add a single-click button called Auto Filter. Once pressed, it would do its best to analyze the message and create a new filter, and then file future messages into this new category. 10. A monthly word limit.